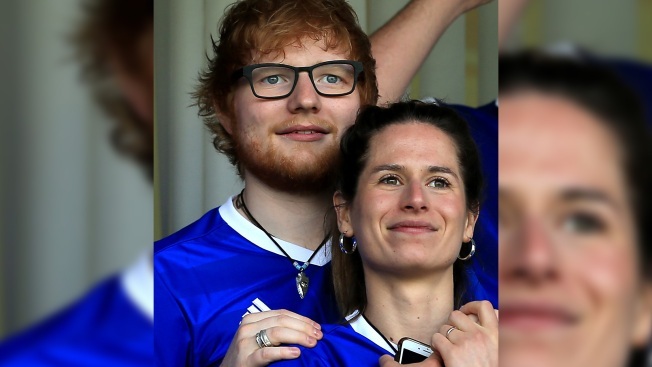 In this April 21, 2018, file photo, musician Ed Sheeran and then-fiance Cherry Seaborn look on during the Sky Bet Championship match between Ipswich Town and Aston Villa at Portman Road in Ipswich, England. The Sun's Dan Wootton reports Ed Sheeran and Cherry Seaborn tied-the-knot in an intimate ceremony. Apparently, the two got married just before Christmas at the superstar's English country estate in Suffolk. The publication claims celebrities weren't invited to the wedding, which means there was no sign of his pals Taylor Swift, Rita Ora or John Mayer at the top secret event. If anything, The Sun reports the ceremony was so small and intimate about 40 friends and family members attended. "It was very quiet - just Ed's oldest school pals, limited family and the priest," a source told the outlet. "He wanted no fuss and he wanted it to be something entirely for them - just a tiny winter wedding." Adding, "Neither of them were that fussed about making a big deal about it." The "Thinking Out Loud" star popped the big question in December 2017 and shared the exciting engagement news a month later on Instagram. "Got myself a fiancé just before new year," he captioned his post, which was a photo of him kissing Cherry. "We are very happy and in love, and our cats are chuffed as well." The couple has been very private throughout their engagement but this isn't the first time rumors have swirled about their marriage. Back in Feb. 2018, fans thought Ed and Cherry secretly tied-the-knot when he was seen wearing a ring on that finger. "I'm not married," he clarified at the 2018 BRIT Awards red carpet. Adding, "I never saw why men didn't wear engagement rings. It's the same commitment either way. Cherry made it for me herself out of silver clay. I really like it." Last August, the "Shape of You" singer hinted during an Instagram Q&A that the wedding "maybe already happened," when a fan asked, "When's the wedding?" The 28-year-old singer chatted with Entertainment Tonight a few days after his Insta Q&A and didn't confirm or deny his social media statements. Instead, he revealed what he would like his wedding to be like. "I don't like large groups of people at the best of times so.... I never wanted a wedding that was lots of people," he said. Saying that small, simple ceremonies have "a good vibe." Does that sound familiar? If The Sun's reports are true, then Ed really did have a clear vision for his wedding ceremony. Fans with eagle eyes noticed Sheeran wearing what looked like a second band from his silver clay ring Seaborn made him. The Instagram post was shared on Feb. 17. In mid-January, the "Happier" singer shared a couple of snaps on a tropical vacation, which many are speculating was his honeymoon. However, nothing has been confirmed. Both Ed and Cherry have kept their lips sealed on the marriage news, and haven't confirmed or denied the reports. E! has reached out to the singer's rep for comment.